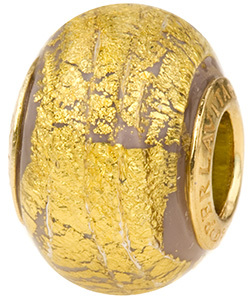 The PerlaVita Ca'd'oro series starts with a base of authentic Murano glass which is accented with 24kt gold foil in the cracked gold format, encased in transparent clear Murano glass and capped with vermeil inserts. This viola(soft purple) colored rondel is approximately 14x12mm with a 5mm hole and will fit on Chamilia, Pandora, Troll, and major brands. Venetian Jewelry at its best. Complete with authenticity card.